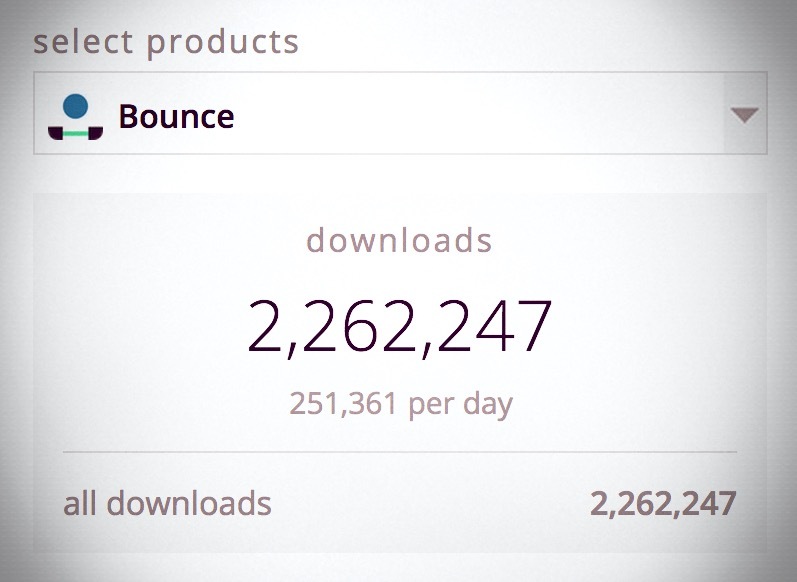 We’re very happy to announce Bounce has crossed the 2,000,000 download mark yesterday which was exactly 7 days after it’s release. Averaging over 250,000 downloads per day since it’s release, this makes Bounce the fastest growing game every created with Buildbox. The previous Buildbox record holder, Phases, received 977,000 downloads during it’s first week, and coincidentally crossed the 4,000,000 total download mark yesterday. At the time of this writing Bounce is still hovering in the Top 50 of all free games and is available on iOS and Android. Make sure to also check out our story of how Bounce was created and see a video of the Buildbox save file. Want to create a game like Bounce yourself? Try out Buildbox with the Game Business Challenge. Whats d source of income for bounce?? Ads or in app purchase?? I’ve been using buildbox for a week now and I have a problem ,I cannot add the invisible buttons at my gamefield menu.I need help because I want to publish this game to the appstores.Thank You. Hi Allan, what is occurring when you try to do this now? Please send details to Support@buildbox.com along with the BBDOC file exhibiting this problem and they’ll assist you. Hey Trey, if I forgot to use the buildbox program during the challenge, can I still use the program even if the challenge is over? can we create games like monopoly,megapolis using buldbox? Hi, creating games like megapolis and monopoly is not currently possible in Buildbox. However, you can make these types of games and more. The original games are listed for inspiration. Buildbox may not be able to make the exact games in every case. Can you export to IOS with the trial version? Hi Josh, no unfortunately in the 15 Day trial version you cannot export to iOS. Can you tell me what other games besides Bounce are made with buildbox published under Ketchapp? Hi Anthony, just Bounce and Phases currently, though there are more coming. Trey I noticed a few games by Ketchapp that have some cool features. Don’t Touch The Spikes how was this created with buildbox? How do you do the dual player feature and all those game options? If this is buildbox it would be an awesome tutorial! For other games like Spring Ninja how do yo make the mobile phone buttons that allow you to hold down to set the strength of the jump? On Stick hero how to you make the controls and stick extend for a mobile app? Hi Anthony, unfortunately a lot of these great games are published by Ketchapp who we work with to publish game through, the ones you mention are not Buildbox creations nor are the game play types supported in Buildbox. We apologize for the confusion. Hi John, yes you can upload your own characters. The images must be in PNG format and be no higher than 70 DPI. They should be scaled down to game size prior to import into Buildbox. Aim for iPhone 5 art standards as a baseline.